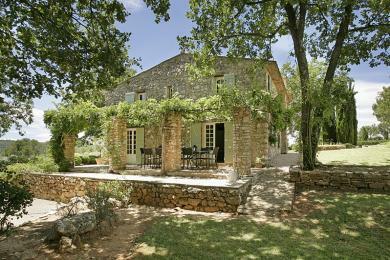 Luxury country side villa with private pool near Fox-Amphoux, Provence. A very special property thanks to the landscaped gardens housing a poolhouse and private tennis court. Stylish interiors in English country chic. The villa sleeps 10. Large private pool, poolhouse and private tennis court. When you enter into the main hall on your left you have access to the beautifully decorated living room and kitchen. Or you could take the stairs to the bedrooms on the first floor. For furnishing the villa there has been chosen for luxurious materials and fabrics. Modern (Kitchen) equipment and comfortable indoor and outdoor furniture make this villa a very pleasant place to stay. The living room has a really special atmosphere due to the presence of wooden beams in combination with the new luxury furnishings and beautiful accessories. The kitchen is spacious and offers a large dining table (10 persons). The kitchen is fully furnished and equipped with modern Miele equipment. Of course there is WIFI, TV and a Bose Sound System. There are five romantically decorated bedrooms and 4 bathrooms all on the 1st floor. Bedroom 1 is the master bedroom with an en-suite bathroom (shower and toilet). The room is spacious, air conditioned and there is a double bed (160x200). From this bedroom you have a beautiful view over the hills of the Provence. Bedroom 2 and 3 both have a double bed (140x200) and both have a private en-suite bathroom (shower and toilet). Bedroom 4 and 5 has two single beds (2x90x200). These bedrooms share the fourth bathroom (bath/shower and toilet). Through a cypress lined driveway you will arrive at a large parking lot at the villa. The land measures over 57,000 m2 and is divided into a landscaped garden, a fenced pool, a private tennis court and an olive yard (200 pieces) and a fruit yard. There are several seating areas and terraces in this villa. The kitchen provides access to a outside terrace with a large dining table. There is a dining table right next to the kitchen and there is an extra large dining table at the front of the house on the stone terrace. the terrace of the kitchen is covered by a pergola, ideal for a delicious breakfast or lunch in the shade. Very special is the private tennis court located at the front of the villa. Also nice is the extra large lounge with a view of the village of Fox Amphoux. The villa has a spacious pool wich is fenced (10x6 and heated) and a poolhouse with fireplace (very nice in the spring or autumn). The swimming pool and sun terrace have a good sun position. At the pool there are nice sunbeds. There is a private Jeu de Beules lane for a pleasant game 'pétanque’ and also a ping-pong table. There is more than enough parking space for cars. The BBQ is a Weber Gas BBQ. Tennis rackets and tennis balls are available for you! Fox Amphoux is a medieval village perched on a hill. The famous Gorge du Verdon is located 30 minutes from the villa. The same applies to the beautiful blue-green Lac de St Croix. The coast, for example, Sainte Maxime is about 1 hour and 15 minutes away. Because of the privacy the Google Map location is set on the center of the village. The villa is actually a few minutes from the village. Also see the item location. Kids are more than welcome! Very nice for families with children is the lockable fence around the pool. The spacious grounds are mostly flat and the amount of ​​space is a true children's paradise. Also the tennis court and the Jeu de Boules Lane are quite special! Pool: Private Pool size: 10 x 6 m.